Today’s fact: Down syndrome occurs evenly among boys and girls. I helped out at Kalena’s preschool party today. Daniel found the whole thing hugely thrilling. See? I have no pictures from the actual party (besides that one of Daniel) because I was running the bingo station. Hopefully someone else took some! About halfway through the party Kalena’s teacher informed me that Will was pigging out at the treat table. I apologized, but she assured me it was fine, she just wanted to warn me in case he was all sugar high later. Fortunately he ate lunch despite his indulgence and then both kids crashed for naps. I have a really great picture of Will eating grapes (with a fork!) but wordpress is not cooperating with iphoto (or maybe the other way around) so you don’t get to see it. That picture of Daniel made me laugh outloud. He snored. 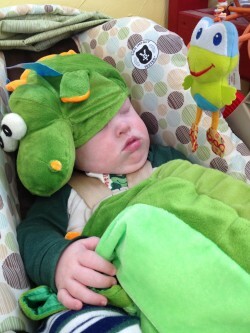 A classroom full of noisy preschoolers, and Daniel is in a car seat wearing half a dragon costume, snoring away. I love that Will was all, “Well! Don’t mind if I do…” at the treat table. Hilarious. I know! I thought he’d be more distracted by the playground. Apparently not!